As far as blogging goes, I’m still in Barcelona: though in reality I’m snuggled in a cosy jumper looking upwards as a grey sky turns greyer. In Barcelona, we visited the Monasterio de Pedralbes. It’s not actually a monastery, because no monk has ever lived there. It’s a priory, built in 1326 by King James of Aragon for his wife Elisenda de Montcada, who wished to found a community of Poor Clares there. Poor Clares? These are nuns who devote themselves to a life of simplicity and prayer, and in Elisenda’s time were almost always drawn from the ranks of the aristocracy. She herself never became a nun, but she was very real presence in the life of this community. And what a fine place it is. A graceful three-storied cloister surrounds a peaceful garden. Here is a fountain, topped off with a rather cheeky looking angel. This is where the nuns would wash their hands before dining in silence in the refectory, while devotional works were read to them from a pulpit. But it’s the kitchen I’d like to show you. In its day, this was a state-of-the-art workroom. Who wouldn’t like to cook at this unusual kitchen range, supervised by Saint Anthony? Look at these fine sinks, dating from about 1520. There are bread ovens, tiled worktops, and it was here that the simple diet of the nuns was prepared: fresh and salted fish, pulses, rice, vegetables and fruit. Meat was reserved for festivities. A double drainer kitchen sink, without constant running hot water. 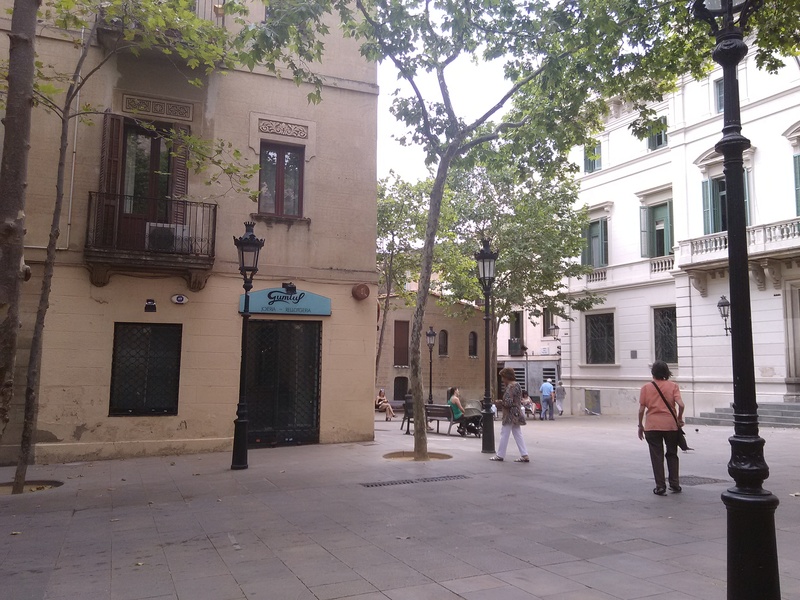 This is another of Barcelona’s hardly-discovered treasures. Just a couple of school parties there, and once they’d gone, we had the place almost to ourselves. Put this on your must-visit list too. This post is my response to this week’s WordPress photo challenge: ‘unusual’. A hospital, a community, a work of art. 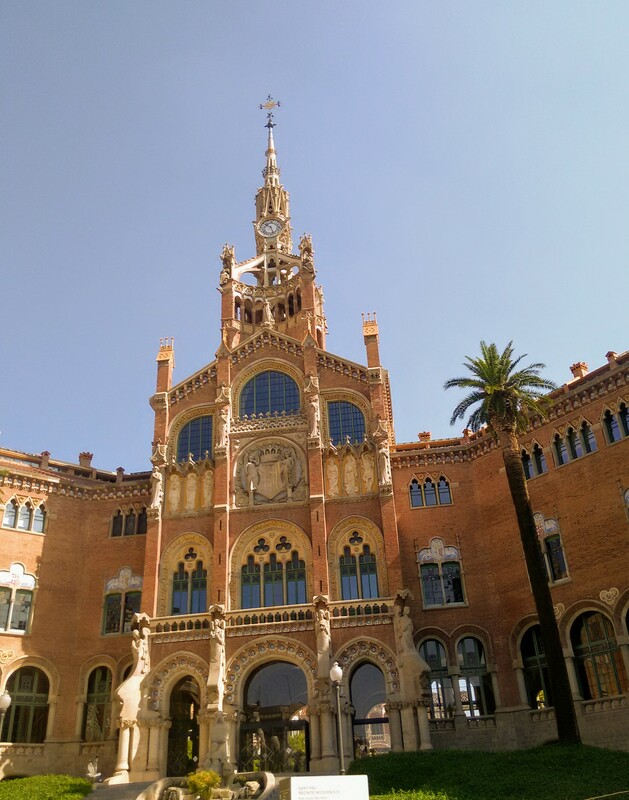 I promised to tell you the story of the Hospital de Santa Creu i de Sant Pau Barcelona, which we visited the other day. A view of some of the site, glimpsed through one of the windows. It’s a story that goes back to the 15th century, when Barcelona already had six hospitals. In 1401 these merged onto a new site in Raval, to offer improved care to the sick. By the 19th century, these facilities were too small, too outdated, no longer really fit for purpose. A Catalan Banker, Pau Gil, put up the money to fund a truly enormous and visionary project: a whole community of buildings offering state-of-the-art care to the poor of the city. The plan was for facilities of the highest quality, designed in cutting-edge modernist style by cutting-edge Modernista architect Lluís Domènech i Montaner. Modernism? Think of it as Art Nouveau, Catalan style. You’ll recognise it in the works of Antoni Gaudi. Montaner found inspiration from Moorish architecture. Playful looking mosaics and the light-flooded areas are the special feature of his buildings. What we noticed straight away was bold colour, bold decoration: rich-hued tiled roofs: and within, tiles and mosaics in sunny yellow, grass green, sky blue. Sun, grass, sky. Why not remind the sick inmates of a cheerful world outside the hospital? Why not have light, airy, high-ceilinged rooms, tiled throughout for ease of cleaning, and because they would never become dingy and faded? Why not build underground tunnels, tiled in cream, so that patients could be moved round the site without being exposed to the elements? Why not build a decent well-lit operating theatre, well-stocked libraries for doctors to consult, and set all these buildings among gardens which patients and staff alike could enjoy? Underground walkways between the hospital buildings. This was a Christian foundation. Nuns provided nursing care until the 1990s, as they had done since the hospital’s earliest years Mosaics in the building told stories from the Christian tradition, such as that of Saint George slaying the dragon. Other carvings and statues relied on ancient legends. This frog nursing a baby frog, for example, is an old symbol of caring love. Originally, men and women were separated, but later, the hospital was organised by specialism. Now, although research continues here, modern buildings behind continue the work of the hospital. A women’s ward in the hospital, 1920s. The foundation stone was laid in 1902, and facilities were developed until about 1930. Large parts of the site were never built at all, from lack of funds. This isn’t surprising. There is nothing of the workhouse about this place. It’s a beautiful, special site, fully deserving of its UNESCO World Heritage status, acquired in 1997. 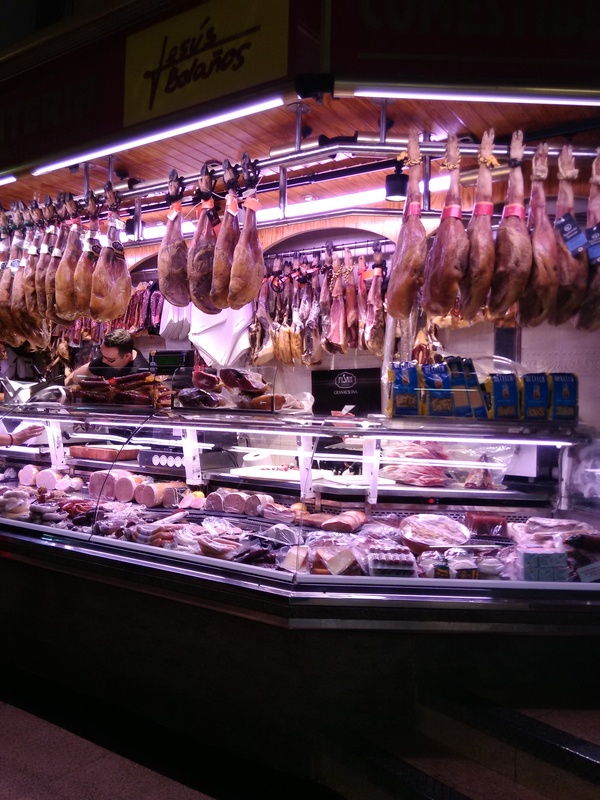 It only opened its doors to visitors a few years ago, and it’s not yet truly on the tourist trail, despite being just up the road from then Sagrada Familia which is always surrounded by hordes of tourists. Visit it now, while it’s still an oasis of calm. It’ll be somewhere you’ll remember forever. I’d intended to go into the story of this place in more detail. But a fellow blogger, Restless Jo, whom I ‘met’ only recently, introduced me to a series of posts by a blogging friend of hers, Jude. Here’s a link to the first one, from which you can reach all the rest. She tells and illustrates the history of this place so well that, quite simply, I don’t have to. 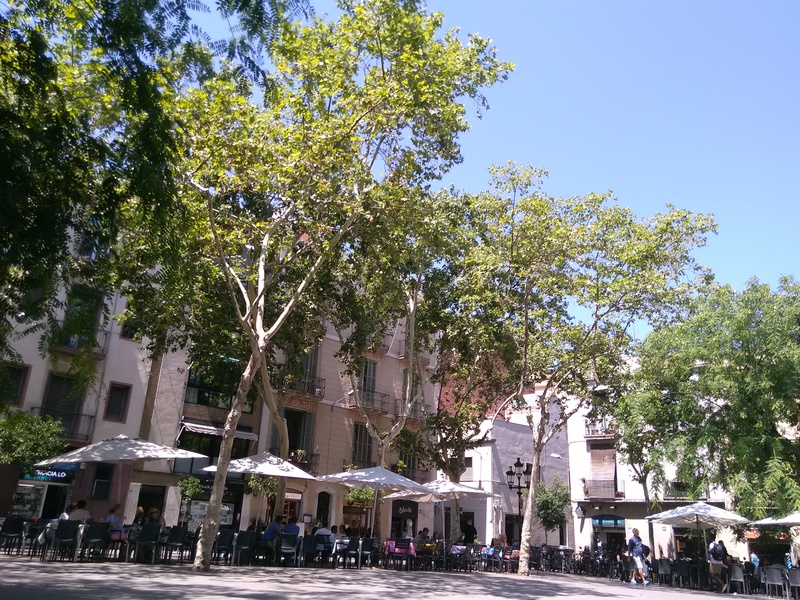 Author margaret21Posted on July 18, 2017 Categories Barcelona, Heritage, SpainTags Hospital de Santa Creu i de Sant Pau, Lluís Domènech i Montaner., UNESCO World Heritage Site27 Comments on A hospital, a community, a work of art. Yesterday, we left Barcelona. As we walked from our hotel to the metro station down a quiet calle, we noticed these accidental collages: walls whose damaged plaster work revealed the original brick beneath; damaged multi-surfaced walls where graffiti had been added; brick walls juxtaposed with stonework, with decorated tile work, or with handsome brick decoration; a nursery school whose facade had been decorated with a festive collage of coloured streamers and children’s drawings. They fit, rather loosely it’s true, with this week’s WordPress photo challenge: collage. 1. Stay away from the city centre. Begin your day mooching around a neighbourhood market. 2. Stroll through the university zone and a peaceful park. 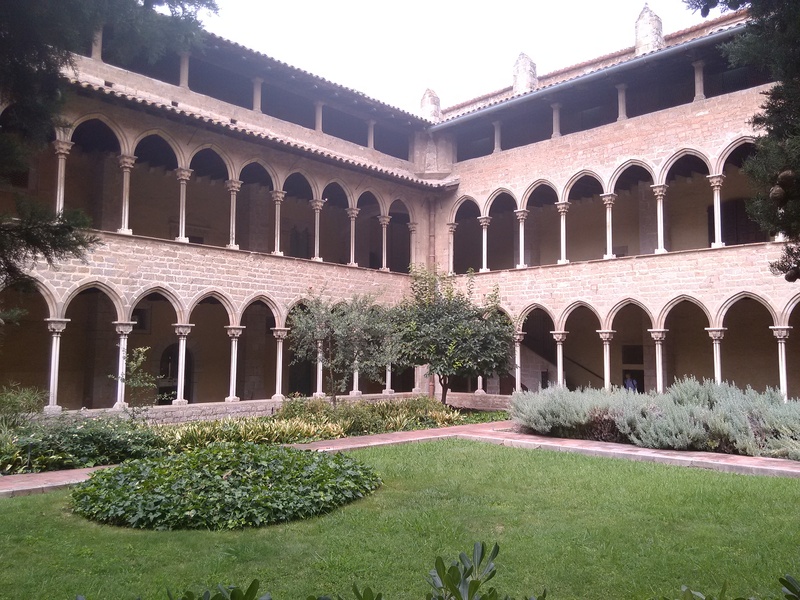 Visit the serene and beautiful Monasterio de Pedralbes, and spend time in its ancient cloisters. 3. 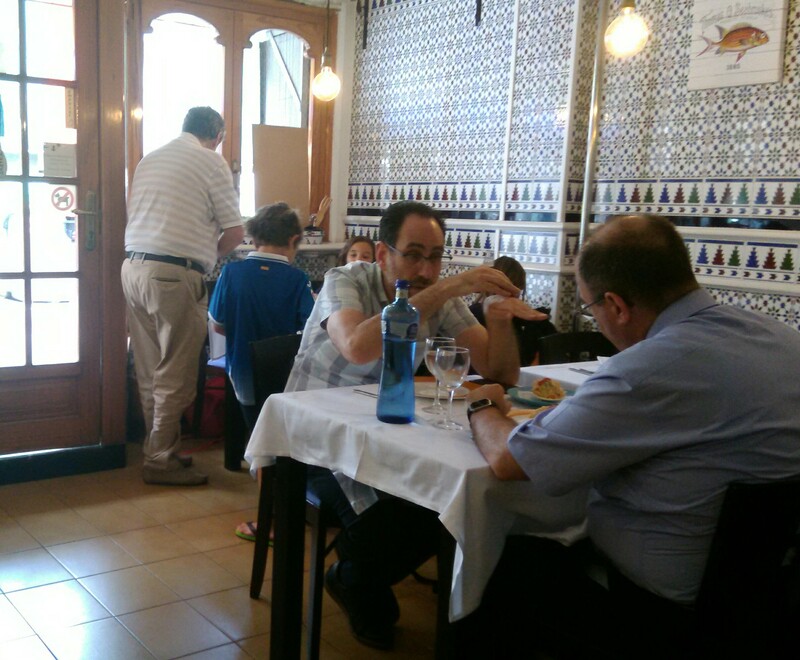 Afterwards, in the nearby well-heeled suburb of Sarrià , find a quiet square to linger over a restorative clara. 4. Later still, mooch round looking for a lunch spot where the locals eat: office workers, the granddad who’s collected his small charges from their hockey game, that sort of thing. Enjoy. 5. Later, much later, meet Emily and Miquel. Another meal, I think. Watch this space. It hasn’t happened yet. We’ve just snuck over to Barcelona. Just for two and a bit days. Just to see Emily, because the last time we were together was in South Korea last autumn. This morning was sightseeing. I’ll just show you a single photo of the Hospital de Sant Pau, a truly wonderful complex of modernist buildings, and a UNESCO World Heritage Site. You’ll get the full tour once we’re back home. This afternoon was hot. No better way to spend it than catching up with Emily over a leisurely lunch sitting in a tree lined square. It’s what the Spanish do best.